I agree with you about the politics here, but you already know that. Things will work themselves out. Wait and see. In November the climate will change. Until then they (wacko left) will shove a ton of crud down our throats. Immigration is next. 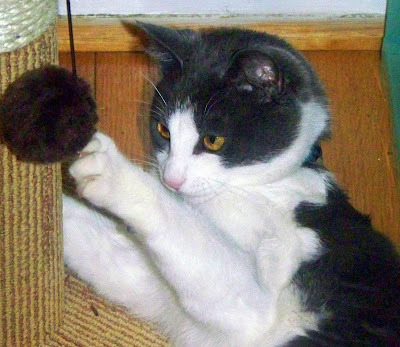 Tesla is so cute playing with his fuzzy ball and scratching post. Ya know what? I am one of those eleventy million people who has no health insurance because the premiums were going up about 28% PER MONTH! And I had to choose between my mortgage and my health insurance. And even I know they should have passed a bill that was RIGHT, not just right now. I mean, they've had a lot of time to get it right, haven't they? They've all got multiple degrees, so they must be aat least a little bit smart, right? And what is with every bill having so many special interest things added to them. Why can't they pass a clean bill? Ever? Oh wait. I don't discuss politics. Sorry. I forgot. He frightens me, Linda. I've heard other politicians rant and rave the way our President has been...and I won't say who. I'll just say it's scary. It's not presidential. There's no decorum. There's no diginity. There is, however, a cult of personality. very well said my friend. it is scary to think how this will be paid. I've heard a lot about this. How it will be paid is something Obama would rather not answer. There really wasn't enough caffeine in the world to keep me awake today. I am SO looking forward to bed tonight! Hope today is a better than blah day for you. Things are always darkest before dawn... that's all I can say and hope about the way things are right now. Good analysis, Linda. I hate it when control and power overrules common sense. And they think we'll forget about this come November! We now have the "divided" states of America. I've read a few states want to start a lawsuit.